Each day, we have a wide variety of members walk through the doors of our four Fit Factory Locations. Some are elite athletes looking to stay on top of their training, some are young professionals looking to de-stress from work with a workout, some are just beginning their fitness journey coming in to meet with a personal trainer, and some are somewhere in between all of those things. Everyone's story is so different, and that's our favorite part! We love learning about YOU and why you decided to join the Fit Fam. We love hearing all that you've accomplished. We love listening to all of the new goals you've set for yourself, and being here to watch you acomplish and exceed them. You and your unique stories is exactly what makes Fit Factory so special. "I have always had gym memberships but never really used it. Fit Factory, Braintree changed this for me. Specifically, the group fitness classes. I started coming to this branch of fit factory around september 2018. Today, almost 2 and half months later I have lost 18 pounds. I feel the healthiest and strongest I have ever felt. GROUP FITNESS class is EVERYTHING! Zumba class is my favorite, both Kelsey and Sarah are absolutely fantastic. Class is fun, fast paced and you will definitely get out of the class drenched in sweat feeling exhilarated. Dance routine is easy to catch on but challenging enough it will keep you coming back for more. Some of the other classes I love are the total body burn (Sarah), Kickboxing (Kelsey), HIIT (Alli and Kelsey), Barre (Kelsey) and Yoga (Rebecca, Danielle, Sarah). 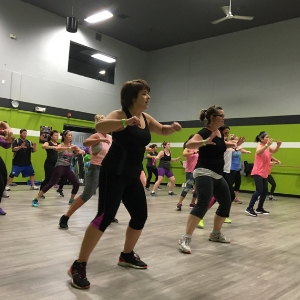 HIIT classes are a must if you are looking to lose weight and get strong at the same time. Special shoutout to Kelsey (Group Fit coordinator)-Kelsey is a total Boss Lady and has done an epic job putting a great team of instructors together. I want to thank Kelsey and her team for changing my life for good. I am going into 2019 feeling Fit and Fabulous :)"
Thanks for being a part of the Fit Fam, Diya! We can't wait to see what you accomplish in 2019!